Students at Woking College for whom English is not their first language celebrated their academic achievements last week. 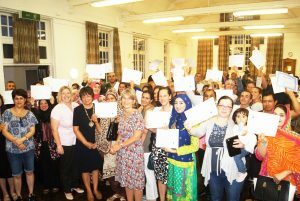 More than 100 English for Speakers of Other Languages (ESOL) students gathered at the Maybury Centre in Woking to have their hard work officially recognised. The students, who come from more than 30 different countries, were delighted to be awarded their University of Cambridge Examinations Certificates by the Mayor of Woking Anne Murray. The ESOL Skills for Life Courses are for adult learners aged 16 plus whose first language is not English and who are living and trying to settle in Britain. A special annual award for the ESOL Learner of The Year was presented to Angel Changa from Brazil and Sanaz Eghtesadinia from Iran for their commitment to learning. Sanaz said: “My course at Woking College changed my life. It has given me back my smile.” Senior Manager at the college Karen Foan, and Head of Essential Skills Rachel Simpson, congratulated all the achievers. The ceremony was followed by refreshments and food where the students contributed a selection of dishes from their diverse cultures.